They have been used medicinally for over 8,000 years and still not out-dated. Dates contain an array of vitamins, minerals, anti-oxidants, unsaturated fatty acids and fibre. Rich in magnesium, dates help regulate the cardiovascular system. Rich in potassium, they help lower blood pressure. They strengthen the bones, reducing the incidence of osteoporosis. They are satisfying when you need a sugar hit and, due to their high fibre content, do not raise the blood sugar level so rapidly. Dates increase energy levels without the accompanying weight gain of high sugar foods. Dates contain 50% glucose and 50% fructose, and do not raise blood sugar levels in diabetics as much as other fruits do. They promote colon health and regular bowel function. 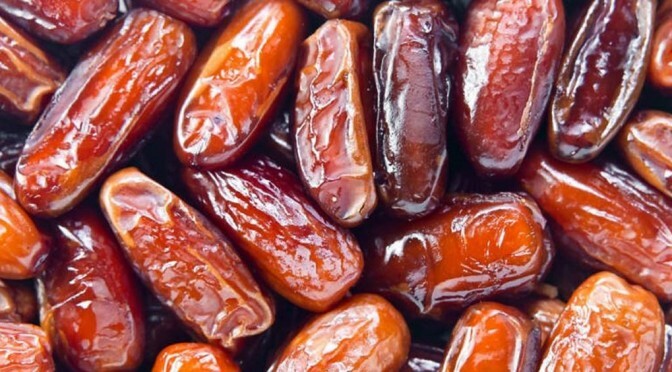 Dates contain both soluble and insoluble fibre to clean out the gastro-intestinal system and relieve constipation thus helping to prevent haemorrhoids and colon cancer. They have even been shown to treat sexual impotence, sperm count and motility. Dates contain high levels of iron, increasing energy and reducing fatigue and preventing anaemia, especially in vegetarians. The anti-oxidants in dates destroy free radicals that are responsible for cancer and debilitating effects of ageing. The magnesium in dates reduces inflammation in the body and in the arterial walls, effectively reducing the risk of cardiovascular disease, arthritis, Alzheimer’s and other inflammation-related conditions. They contain a neuro-protective agent in diabetic neuropathy and they have also been shown to improve cervical dilatation in labour, when consumed for four weeks prior. Dates are best enjoyed as the fresh fruit, either on their own with nuts or in one of these delicious recipes to follow. Blend almonds for no more than one minute, then add other ingredients and blend till smooth. Wilting the kale makes the mineral content more bio-available. 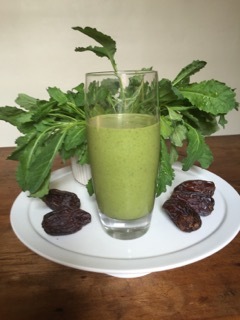 This drink is alkalysing to the body, satisfies sugar cravings and restores energy levels.